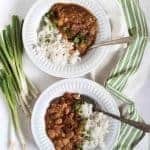 Instant Pot or slow cooker Cajun beans and rice is going to become a quick family favorite all winter long! This recipe was SO much fun for me to develop. I’m new to my Instant Pot, but I’m starting to really like it. Cooking in it is a lot of fun because I’m having to work and think about the recipes. It’s like learning a new cooking skill which I love. I made this recipe many times getting it just right (ask my neighbors and friends – they all tried it!) and I’m so proud of how it turned out. 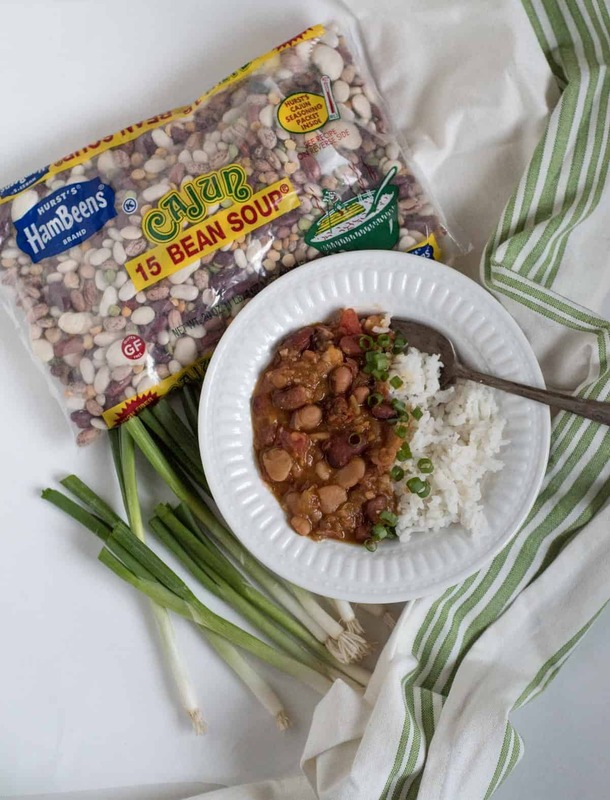 This Cajun beans and rice recipe is made using Hurst’s HamBeens Cajun 15 Bean Soup Mix and I’m working with them today -such a great Indiana-based company I have been using for years. What’s great about this beans and rice recipe is that you can make it in either the slow cooker or the Instant Pot which means that you have no excuse not to make it! 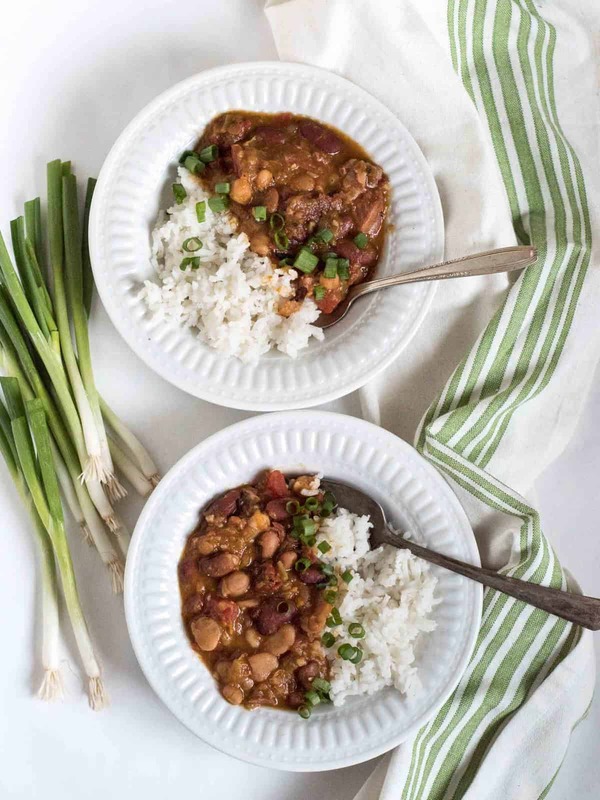 The beans are cooked to perfection in just 45 minutes of cooking time in the Instant Pot and about 8 hours in the slow cooker. Both are great options. The beans are a little thicker than soup and seasoned with all kinds of veggies, smoked ham, and broth and then served over rice. This is a great, inexpensive meal to make all winter long and I’ve included lots of tips and tricks on how to make it a few different ways. 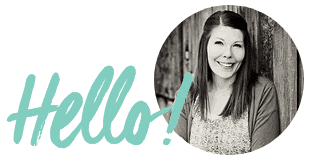 Here’s why I’m excited to be working with Hurst’s Beans today. Hurst’s is a 4th generation family-owned company that is based out of Indiana (I was raised in Indiana and consider myself a Hoosier through and through), and they’ve been a brand that has been in my cupboard, my mom’s cupboard, and my grandma’s cupboard for years and years. I grew up loving the 15 Bean Soup Mix, and their products are ones I use and know well. I’m so excited to be working with them today. They grow their beans in the US and Canada (yay! ), and the flavor packets really are just seasonings in a convenient little package. They are gluten-free and vegan and have no added MSG. This is a great brand, and I can’t wait for you to bring them into your own kitchen if you haven’t already. Smoked ham shanks are a bit unusual but they are great! They are an inexpensive cut of meat that gives this dish a ton of flavor. Ham hocks are a similar cut that tend to be more meaty (and a little more expensive). Whichever you get, make sure they are smoked; that’s where all the flavor comes from. This is an easy dish to make vegetarian too, if you’d like. I tried it all the ways! I have notes on substitutions if you are looking for more meatless meals in your life. I got this 8-quart Instant Pot on Black Friday (my only purchase of the day! ), and it’s awesome. I like the bigger size so that I can make big batches of chicken broth in it. You can add a lot of fun toppings like hot sauce, sour cream, or pickled jalapenos to this dish. 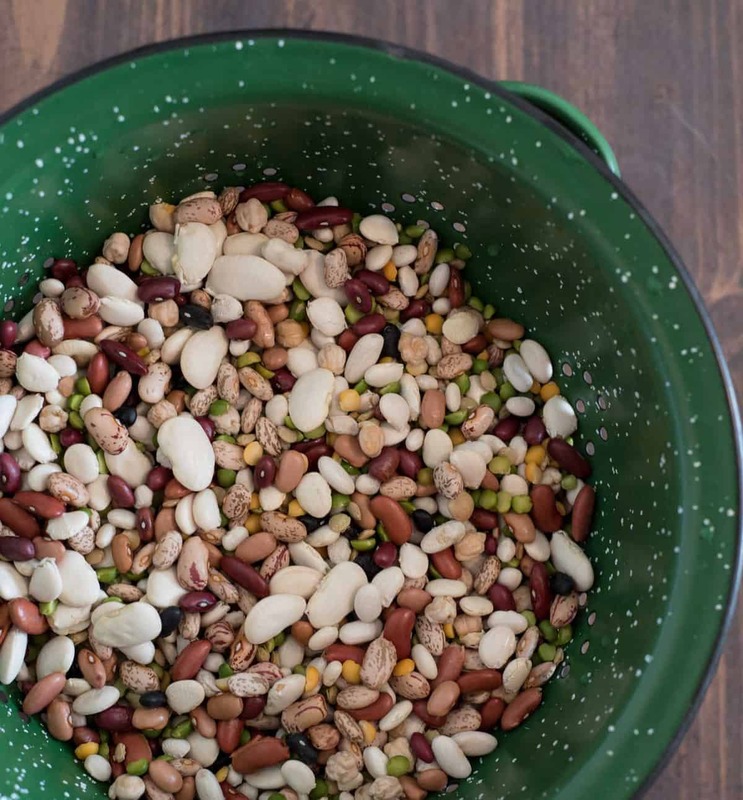 Toppings are what make my children try something new, so if beans and rice is new to your family give them topping options to encourage them to try it. This dish can sit in the Instant Pot on the “keeping warm” setting for a long time. It’s a great one to make in the middle of the afternoon and just let it sit in the Instant Pot until you are ready to serve. Do you have to soak your beans before using? No! They cook just fine without soaking. You can if you’d like, though – simply soak them in water overnight or for 8 hours before using. If you soak your beans, reduce the broth in the recipe by 1 cup (from 7 cups to 6 cups). Set the Instant Pot to saute. Add the oil, onion, bell pepper, celery, and carrots and saute until the vegetables are tender, about 5 minutes. Add the broth, beans, seasoning, garlic, thyme, cumin, bay leaves, and diced green chilis. Stir to combine. Place the lid on the Instant Pot, make sure the top pressure gauge is closed (set to sealing). Press the pressure cook button (also known as “manual” on some models), set the pressure to high for 45 minutes. Let the Instant Pot come to pressure, cook for 45 minutes, and then you can manually release the pressure or let it come down on its own. It’s up to you and your time restraints. Open the Instant Pot carefully and remove the ham shanks, placing them on a cutting board. Remove the meat from the ham shanks and discard any bone, fat, or other non-edibles. Return the meat to the Instant Pot as well as the can of diced tomatoes, juice included. Stir to combine well. Serve over hot cooked rice with your choice of toppings. Heat the oil over medium-high heat in a cast iron skillet on the stove. Add the onions, bell pepper, celery and carrot. Saute until the vegetables are tender, about 5 minutes. Add the contents of the skillet to the crock of your slow cooker. Add the broth, beans, seasoning, garlic, thyme, cumin, bay leaves, and canned chilis. Stir to combine. Cover and cook on low for 8-10 hours or on high for 6-7 hours or until the beans are tender and cooked through. Remove the shanks from the slow cooker and place them on a cutting board. Return the meat to the slow cooker as well as the can of diced tomatoes, juice included. Stir to combine well. If you like your beans thick and creamy, make them as directed. If you like a thinner, more soup-like consistency, add an additional cup of broth when the broth is added. Be sure to not under-salt this dish. The amount needed will depend a lot on your broth of choice. You can omit the meat, though it won’t be as flavorful. To compensate for that, add 3 tablespoons of soy sauce in place of the meat. When it says “sort” the beans, that means to pick through them for any debris that might not be beans (like little stones). Save the ham bone from Christmas dinner and use it in place of the shanks! How fun is that? So simple too! I hope you love the very first Instant Pot recipe here on Bless this Mess. There are many more to come! If you want to skip the rice in this dish, it would be great served with zucchini cornbread or simple corn muffins on the side. Enjoy, from my kitchen to yours! Disclosure: This is a sponsored post written by me on behalf of Hurst’s Beans. Thank you for supporting the brands that help make Bless this Mess possible. Your first instant pot recipe and it will be my first instant pot dish I make…..I get one for Christmas but have to wait until the end of January to meet up with the kid….the suspense! Hurst should put your recipe on their home page with the others..tee hee! If they had that 15 bean soup in the UK, I’d buy some! This sounds so yummy, and I love the addition of cajun spice. Looks amazing! Can’t wait to try this. Pinning! I haven’t jumped on the instant pot wagon quite yet. I’m not sure what I’m waiting for. It just may be that I’m not too keen on having another large appliance to put away for find space for. Regardless, I think this recipe looks hearty and delicious. My husband is a big fan of ham and beans coming from Pennsylvania Dutch country and with winter in full swing I can’t think of anything better than a yummy pot of soup. I used the leftover ham bone from Christmas which still had some ham attached we couldn’t get to. As suspected, It fell off the bone while cooking. I followed the recipe with one exception: I left out the carrots. We were pleasantly surprised at the flavor of this dish. It was not spicy at all. In fact, I added some andouille sausage to leftovers to give it a bit more spice. We will keep this recipe. It was a nice change from our typical red beans & rice. I’m so glad you liked it! Thank you for noting your changes, that’s always helpful information for others! I live in the SLC area. Where do you buy the beans? I would love to try this recipe. WalMart and Smiths both had them! Could you substitute a can of Rotel for the diced green chilis and can of roasted tomatoes? Yes ma’am that’s work just great and be delicious too! This is my first attempt at using my instant pot and I was very intimidated going in. This is a great recipe. I swapped out ham for smoked sausage. I probably should have added the sausage at the end when I added the tomatoes, but I wasn’t sure so I threw in cut up pieces. They turned out a bit soft, but edible. Great flavor. Welcome to the Instant pot family!!! 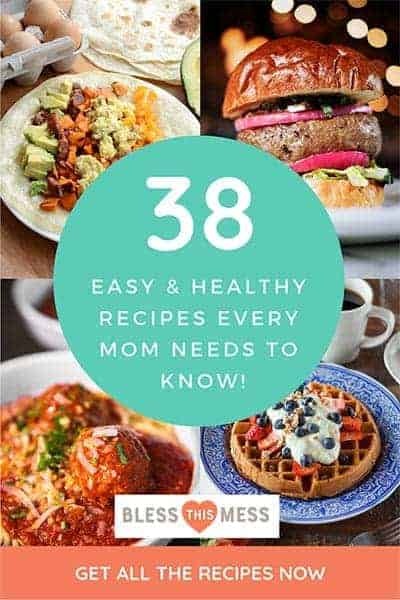 You’ll find your groove with it and I’m so glad you chose this recipe as a place to start! It is delicious and so full of flavor!